It’s one of those times of year where you might be trying to think of a gift for me. 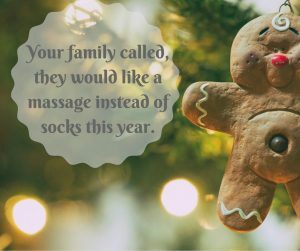 While I’ve enjoyed the socks/ties/perfume/jam-of-the-month club memberships you’ve gotten me in the past, I have another idea…what I’d really love is a massage/Thai massage/reflexology session with Annalisa Derryberry, LMT. It’s something I’ll definitely use, and I’ll be a happier, more relaxed partner/parent/employee/believer-in-you. You can purchase a session or a package at her store online, and she’ll email you a gift certificate you can print out and stick in a card or stocking, or get an e-gift card for a dollar amount that I can use for any of her services. It’s really easy, you’ll be supporting a friendly local business, and I’ll be sure to sing your praises as the best gift giver EVER! This entry was posted in Massage on November 22, 2017 by derryberrymassage.